In this segment we go over the basic structure of the admin settings to get a better understanding of where to find things. 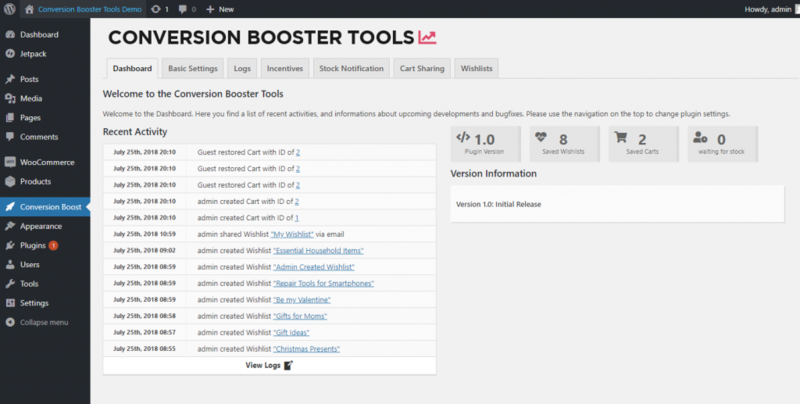 Once you installed the plugin you can click on the new item in the admin menu called „Conversion Boost“ which leads you directly to the plugin dashboard. Upon clicking on the Conversion Boost Link in your WordPress admin menu you are greeted with a list of recent actions that were performed in relation to plugin features. Logs record creations of new wishlists, shares of shopping carts or new subscriptions to stock notifications on products that are currently out of stock. The Dashboard also shows some basic statistics like how many people are currently waiting for new stock, how many wishlists are currently active and the current plugin version.